Neverwinter has already scheduled their second expansion pack, complete with a brand new Hunter Ranger class, a collections system, expanded Paragon tree skills for the other classes, Artifacts, and a new Dread Ring Campaign! The big question is: will players be willing to constantly pay for the new content in a F2P game where they’re already tied to the cash shop to advanced in the endgame? Did you catch our Sprite Companion trailer last week? You may have caught a glimpse of a mysterious figure at the end of the trailer. 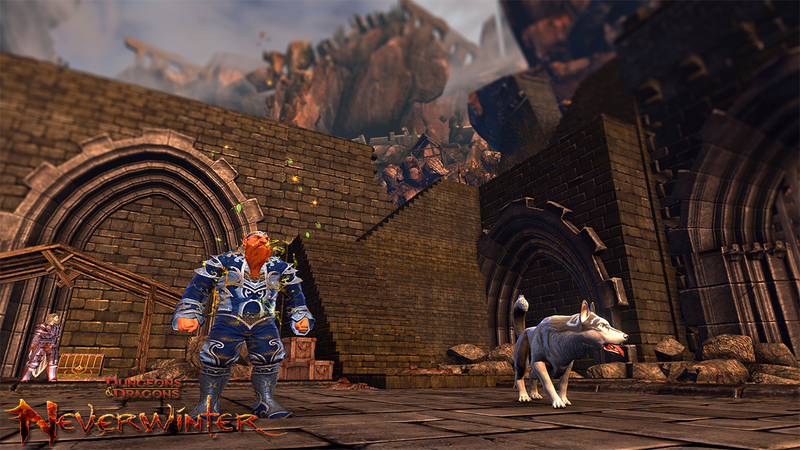 We are proud to reveal that mysterious figure will be the next playable class in Neverwinter: the Hunter Ranger. The new playable class is part of Shadowmantle, the second free expansion Module coming to Neverwinter. But, that’s not all Module 2 will bring. Since the launch of the Feywild expansion, the Neverwinter Team has been working hard at expanding the Neverwinter experience. We are excited to reveal some details on upcoming changes and additions to Neverwinter and how they’ll provide you with more combat choices and ways to improve the way you play. 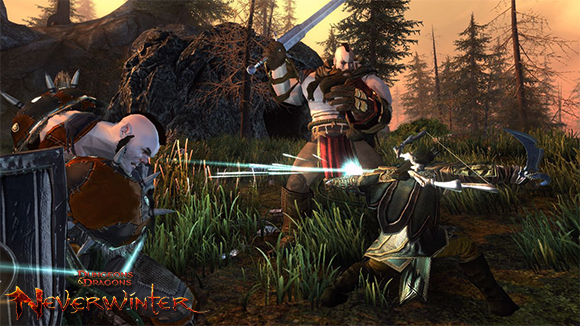 From the depths of the Neverwinter Woods comes the newest class, the Hunter Ranger. The Hunter Ranger has the unique ability to strike down opponents from range with his/her bow, or get up close and personal with his/her blades. This will be a unique gameplay experience, giving players the opportunity to switch from ranged to melee on-the-fly. Ever since our live launch, there have been many requests for an archer and we couldn’t be more excited to offer the new class in the upcoming expansion. 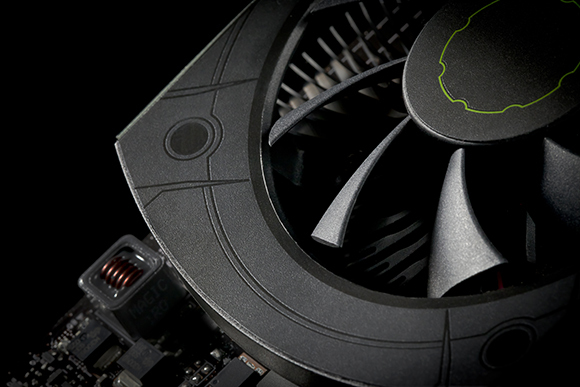 We will reveal more details in an upcoming blog so be sure to check back for updates. Check out the reveal trailer below to see the Hunter Ranger in action. Ever wanted to turn your Guardian Fighter into a Swordmaster? Do you wish your Control Wizard could use fire spells instead of lightning? With the Shadowmantle update, you’ll be able to try out new abilities with new Paragon Paths. The expansion will add brand new selections of powers along with new Paragon Paths for each class. Each path will give the player one new At-Will, one new Encounter, one new Daily, three Class Features and three Feats. This will introduce a variety of combat choices and bring a more unique gameplay experience to each player. Deep within Neverwinter Woods lies the Dread Ring, a massive structure built as a focus for ritual magic, now broken but still powerful. One should take caution when entering this land as even the most unobservant adventurers can tell this is a warped place. The Dread Ring Campaign will introduce new loot, new rewards and buffs, more powerful items and iconic Dungeons & Dragons bosses to battle. We’ve heard your feedback regarding the Feywild campaign, and we’re happy to announce that the Dread Ring Campaign progression will be much less linear. With Shadowmantle, we will continue improving your gameplay experience with Artifacts. These are brand new items you can equip to your character, just like any piece of equipment. Furthermore, these items will grant you unique powers and will continue to get more powerful as you level them up. Artifacts can be obtained through quest rewards, campaign rewards or as loot from monsters. For the adventurers who love achievements and collecting items, we’re happy to announce the Collections System. Very similar to achievements, this system will be based on items collected rather than actions you completed. By collecting certain items in-game, like companions, you’ll earn points which will net you some nice loot. It’s never been so rewarding to be a hoarder! With the Artifacts, the Collection system, and Paragon Paths, we hope to address balancing concerns along with improving your overall gameplay experience. In addition to these features, we are also implementing the vote-kick system, a highly-requested community feature. This is just a sample of what the Neverwinter Team has in stored for you with the Shadowmantle update. We are always striving to provide you with the best possible experience and community feedback has played a key role in the addition of upcoming features. We’ll have much more to share with you, so be sure to come back often to check out more details about the upcoming expansion. You’ll be able to check out Module 2 content on the Preview test server very soon. Once Shadowmantle is available on Preview, head here to join the Preview server and explore Shadowmantle for yourself! Are you excited for the challenges and rewards ahead? Let us know on the official Neverwinter forums. If you’re looking for a video card upgrade either now or at least before the end of the year, Neverwinter is offering a pretty sweet deal: purchase an eligible GeForce GTX and get 1 million Astral Diamonds. Easy peasy. The Forgotten Realms is unquestionably a beautiful setting. To fully reveal the intricate details of every feature, monster, and adventure zone in Neverwinter, you’ll need to equip yourself with the necessary tools to do so. Fortunately, Neverwinter and Nvidia have teamed up to provide you with the best in-game graphical experience possible! You may be wondering, how? It’s easy. Purchase an eligible GeForce GTX video card or notebook and get 1 Million Astral Diamonds in Neverwinter! Click here to find out more about this special promotion. This promotion ends on December 31, 2013 so do not miss out! What will you do with 1 Million Astral Diamonds? Let us know on the official Neverwinter forums. As if the Fury of the Feywild wasn’t a big enough launch this week, Neverwinter devs announced the inclusion of the Feywild Lockbox: treasure boxes filled with myriad rare and epic items including crafting and enchantment packs, planar idols (worth up to 50k astral diamonds), and rare accessories. Neverwinter adventurers! With the upcoming Fury of the Feywild Module, live on August 22, 2013, Sharandar will introduce you to new and fearsome enemies including the deadly fomorians. And, always be wary of Valindra Shadowmantle because her influence is ever-present in Neverwinter. 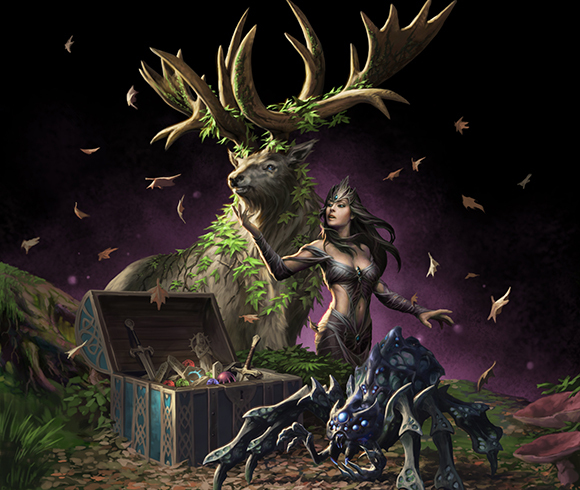 Among the upcoming changes to the game, many based off your feedback and suggestions, we’ll be introducing the new Feywild Lockbox. These new lockboxes could reward you with new treasures and items to better prepare you for the difficult battle ahead. Don’t forget that each lockbox requires its own Enchanted Key before you can reveal what’s inside. You can find Enchanted Keys in the Zen Market by pressing ‘Y’. 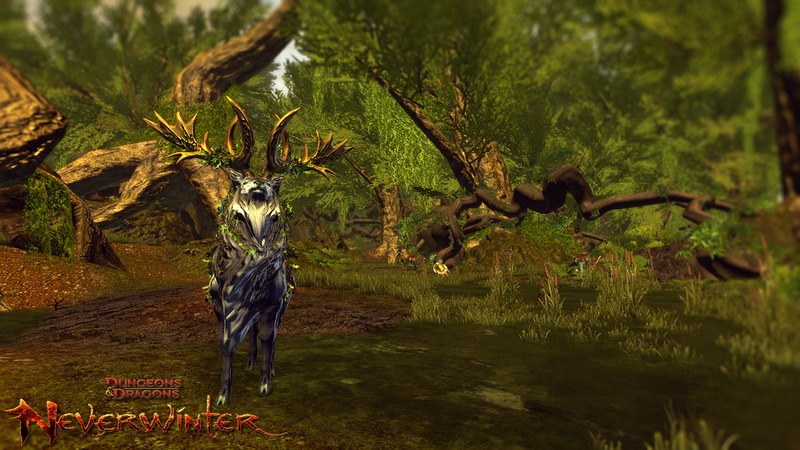 Sylvan Stag – A large breed of stag that is typically deep within Neverwinter Wood. Widely considered to be one of the most majestic forest animals, the stag has an impressive body size and a beautiful set of antlers atop its head. Aranea – An aranea is an intelligent, shape-shifting giant spider with innate magical ability. It can assume two forms: a humanoid form with a specific appearance unique to that aranea, and a giant spider. Shimmering Elven Box – Contains Epic enchantments or runestones used to enhance your items or make your companions even stronger. Sylvan Equipment Arsenal – Contains one Rare Primary, Secondary, Ring, Neck, or Arms item for your character’s level and class. Planar Idol – Earn up to 50,000 Astral Diamonds for Neverwinter! Spend them on your most desired in-game items. Weaponsmith and Artificer Pack – You could receive Epic Profession resources or Assets for two new Professions in Fury of the Feywild. Feywild Strongbox of Enchantments – Could contain Epic enchantments to enhance your items to strengthen your character. Faerie Cache of Runestones – Could contain Epic runestones to strengthen your companions inNeverwinter. Illefarn Relic Fragment – Some say this is part of an extremely large and valuable relic from Sharandar. Use this to assist you in the new Campaign System. Please note that Nightmare Lockboxes will not be deleted when Fury of the Feywild is released and will remain in your inventory until you open or sell/trade the items. Which rewards do you want most out of the new Feywild Lockboxes? Let us know on the official Neverwinter forums. Neverwinter has posted their “much-abbreviated patch notes” detailing changes on their test server going into production on August 22nd. Every class has received over a dozen rebalancing changes, there are new chat channels (LFG and Trade), a new endgame zone, new companion, and a new summer festival event are just a few of the big changes coming your way this week! Fury of the Feywild is coming up next Thursday, August 22, and we’re excited to give you a sneak peak of some of the balance and gameplay updates that are coming with the Module 1 launch! A much-abbreviated list of the patch notes is below, and you can playtest these changes when they appear on NeverwinterPreview this week, alongside a host of Fury of the Feywild content! Salvage System, Dungeon Event Chests, and Astral Diamonds Updates – We’ve been listening to your feedback about the ways that endgame loot and Dungeon Delve event rewards work, along with the Astral Diamond costs of different services and items in the game. Check out Lead Designer dinohedron’s forum post for all of the info! Rejuvenation Potions not usable in PvP – We want to make sure that only PvP-specific potions can be used in PvP, and are making sure that PvE Rejuvenation Potions can’t sneak past that rule anymore. Class Balance changes – Class and powers are integral to the game, and it’s important to us that we take the time to vet any changes before pushing them to the live servers. With Fury of the Feywild, we’ll be introducing a host of updates to each class, based on your feedback, our own playtests, and information collected from the NeverwinterPreview shard. Non-Augment Companions and Rank 30 passive powers – We’re continually working to make companions feel more and more powerful, and non-augment companions will now have a passive power that can be enabled at rank 30. Bounty items and the Currency Bag – Based on your awesome feedback, we’ve moved Bounty items to the Currency Bag, to free up more space for uber loots and other items that you may pick up on your adventures. To make sure that you have enough space in your Currency Bag for all of those Bounty items, we’re expanding it to 36 slots. Inventory and Zen Market pages on Gateway – One piece of feedback that we’ve consistently received is the desire to have full control over your crafting experience through the Gateway. Now, you’ll be able to, with new Inventory and Zen Market pages at your fingertips! LFG and Trade chat channels – We’re introducing new LFG and Trade chat channels to help make it easier to find the groups and items that you’re looking for, while also moving that chat outside of the Zone channels. Below is a sneak peak at some of the balance and gameplay updates coming with Fury of the Feywild. Please remember that these updates are subject to change, and keep an eye on the NeverwinterPreview forums for the full upcoming list of changes! And please feel free to share your feedback with us on theNeverwinter forums too! 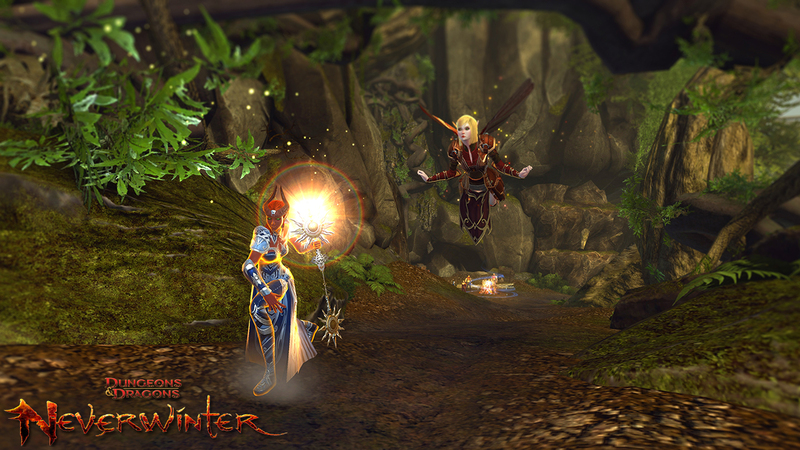 Envoys of the Iliyanbruen fey have come to Neverwinter seeking help from powerful adventurers. Once players complete the opening quest line, they will have permanent access to the newest Adventure Zone, Sharandar. Players can come back daily for more ways to help the Iliyanbruen, and in return, they’ll have access to new gear, new enchantments, and even permanent passive buffs! Companions who have maxed out on ranks can now be upgraded for Astral Diamonds! The companion must be the max rank for their quality, e.g. Rank 15 for common, 20 for uncommon, and 25 for Rare. Once the companion is trained up to that rank, a button now appears to Upgrade Quality. When the button is pressed, a confirmation dialog will pop up, allowing the player to upgrade the Quality for Astral Diamonds. The Quality upgrade is instant once the Diamonds are paid; the max rank goes up by 5 and the rarity of the companion increases one level (e.g. from Uncommon with a green border to Rare with a blue border). Salvaging has once again been implemented for testing on NeverwinterPreview, with a few changes. Most of the information can be found here! There is once again a Salvage Trader and station in the western corner of the Seven Suns Coster Market in Protector’s Enclave. Purple quality gear may be salvaged for Rough Astral Diamonds. Gear rewarded from the special chest that unlocks after the Dungeon Delves event is now Bind on Pickup – But now the player can chose one of the three available stat allocations for that gear slot! New Professions: Weaponsmithing and Artificing! Weaponsmithing: This profession is a new source for Guardian Fighter, Great Weapon Fighter, and Trickster Rogue weapons. Skilled smiths will have the chance to create high-quality weapons with a new look and style, such as Greataxes for Great Weapon Fighters. Artificing: This profession is a new source for Control Wizard and Devoted Cleric weapons. Practiced artisans will have the chance to create high-quality focuses with a new look and style, such as Scepters for Devoted Clerics. Starting at 10:00 AM Pacific on Saturday, August 29, Sergeant Knox will have a quest to point players to the festival grounds near Neverwinter! The Midsummer Festival will be running for several weeks. Log in every day to earn progress toward festival-themed fireworks, a new companion, a new mount, a fashion set celebrating the season, and more! At level 60, Sergeant Knox now guides players to meet Lord Neverember. Lord Neverember now offers a rotating daily quest that gives double the Astral Diamonds that Rhix is willing to pay. Rejuvenation Potions may no longer be used in PvP. Health power-ups triggered in PvP now expire when the player takes damage. Arcane Singularity: This power now properly takes the caster’s Intelligence attribute into account. Arcane Singularity: This power now properly deals full damage to level-scaling enemies, such as Call to Arms orcs. Chilling Cloud: The primary target of this power is now properly considered as hit by an AoE for power and proc calculations. Chilling Cloud: The secondary targets of this power are now properly considered as hit by an At-Will instead of an Encounter for power and proc calculations. Chilling Cloud: The visual effect on the third hit of this power now more properly represents its area of effect. Conduit of Ice: This power no longer incorrectly benefits less from the Power stat than intended. Evocation: This class feature no longer incorrectly stacks with itself. Eye of the Storm: This power previously added too much damage for the duration that it lasted. Rather than redesign the auto-crit aspect, it now procs a bit more reliably, but does not last as long. This power now has a 3% chance to trigger from At-will powers, and is 3 times more likely to trigger from Encounters and Dailies. Ranking up the power now also increases the proc chance, resulting in a 5-15% proc rate based on power type used. Its duration has been greatly reduced, and now lasts for 2-3 seconds based on rank. Ice Storm: The lockdown time after using Ice Storm has been reduced by .5 seconds. Ice Storm: This power can no longer affect targets through walls or doors. Maelstrom of Chaos: Hitting targets with Maelstrom of Chaos now refreshes the duration of Arcane Mastery stacks on the player and any Chill stacks on the target. Maelstrom of Chaos: This power can no longer affect targets through walls or doors. Masterful Arcane Theft: The tooltip of this power has been updated with a more accurate description. Repel: The Spell Mastery version of this power now properly counts as an AoE for interaction with other powers. Shield: Shield Release no longer incorrectly multiplies its Action Point gain for every target hit. Shield: Shield Release no longer incorrectly builds a stack of Arcane Mastery for every target hit, resulting in situations where hitting 5 targets would both max the stacks while also instantly reducing its own cooldown. Storm Pillar: Hitting targets with at least a half charged Storm Pillar now refreshes the duration of Arcane Mastery stacks on the player and any Chill stacks on the target. Sudden Storm: Hitting targets with Sudden Storm now refreshes the duration of Arcane Mastery stacks on the player and any Chill stacks on the target. Feat: Alacrity: This feat no longer sometimes appears as though it’s applied even when the player does not have the feat. Feat: Chaos Magic: This feat now has a new icon. When applied as a debuff or buff, the icon changes color based on what is applied. Chaotic Fury is red, Chaotic Nexus is blue, and Chaotic Growth is green. Feat: Elemental Empowerment: Some powers no longer incorrectly apply a second stack of the DoT effect from this feat. Feat: Elemental Empowerment: This feat now properly affects some powers that it had previously missed. Feat: Focused Wizardry: This feat now properly applies to all relevant powers. Feat: Frozen Power Transfer: This feat no longer incorrectly extends the duration of other buffs and debuffs on the wizard. Feat: Lightning Teleport: This effect is no longer able to rarely trigger multiple times off the same action. Feat: Malevolent Surge: This feat no longer grants multiple stacks for killing a single target. Feat: Nightmare Wizardry: The wording of this tooltip has been updated to be clearer. Feat: Severe Reaction: This effect is no longer able to rarely trigger multiple times off the same action. Feat: Severe Reaction: This feat can now be resisted by immunity to Crowd Control. Feat: Snap Freeze: This feat was previously offering too much bonus damage for a feat that was so easy to access. The overall damage boost from this feat has been reduced by 5% and it no longer affects Daily powers. Feat: Wizard’s Wrath: This feat now properly affects AoE powers. Astral Shield (Divine): Healing is now properly considered to come from an Encounter power. Chains of Blazing Light: The chain no longer sometimes activates in a much larger area than intended. Flame Strike: Damage is now properly considered to come from a Daily power. Forgemaster’s Flame: Ranking up this power now properly improves the Snare effect as much as stated on the tooltip. This improves the effect. Hammer of Fate: This power dealt far too much damage overall, so it’s gained a new feature and had its damage reduced. If the power deals a killing blow, the player will now regain 15% of maximum AP (at max rank). However, the power’s overall damage has been reduced by 40%. Punishing Light (Divine): The cost to maintain this power has been reduced by 20%. Soothing Light (Divine): This power now heals for up to 20% more, based on the target’s missing health. Sun Burst: When hitting both enemies and other allies at the same time, the player now gains 25% more Action Points from this power. However, this power no longer incorrectly multiplies the intended Action Point gain per cast by the number of enemy targets affected. Feat: Cycle of Change: This feat no longer counts as an At-will power for the purpose of triggering effects. Feat: Healing Step: This feat no longer counts as an Encounter power for the purpose of triggering effects. Feat: Sovereign Justice: This feat no longer counts as an Encounter power for the purpose of triggering effects. Bravery: Ranking up this power now affects Run Speed (+15% at max rank), but the Deflect bonus has been reduced to +8% at max rank. Crescendo: This power can no longer sometimes be cast while in the process of casting another Daily power. Crescendo: This power now grants CC immunity while active. Slam: The damage from this power has been reduced; it had previously done too much damage for its area of effect, duration, and utility, and the intent is to change its focus mostly to utility. The initial cast now interrupts targets, and while slowed, affected targets now deal -15% damage (at max rank). The power now shows its max estimated damage rather than its per-tick value, and per-tick damage has been reduced by 60%. Rank ups now provide 1 additional second rather than 2. Steadfast Determination: This is now properly affected by bonuses to Determination. Unstoppable: Several odd cases have been addressed that sometimes caused Unstoppable to be toggled on until the player switched maps. Unstoppable: This ability has proven to live up to its name a little too well as of late. In both PvE and PvP it’s adding a bit too much survivability for how often it can be used. To help address this, the temporary health from Unstoppable now stacks with other sources of temp health, and is consumed first, but goes away when Unstoppable ends. This means that the temp health granted by Unstoppable will no longer stick around after it ends, making it easier to build further Determination from the remaining temp health. Unstoppable: The tooltip has been updated to correctly state that it grants 8-16% temp health (based on Determination). This is not a change in the actual temp health granted by the power. Weaponmaster’s Strike: This power no longer places a long-lasting visual effect on targets. The visual now lasts .5s and has been supplemented by a “splat” to let players know the effect is still active. Feat: Endless Assault: This feat now properly affects Punishing Charge. Feat: Focused Destroyer: The tooltip has had a minor update for accuracy. Feat: Master of Arms: The max Deflect bonus that this feat can provide has been reduced by 33%. Feat: Master of Arms: The first rank of this feat no longer grants a double bonus. Feat: Unstoppable Action: The feat no longer incorrectly increases Action Point gain for longer than expected after using Unstoppable. Feat: Unstoppable Recovery: The tooltip has been updated to properly state that this feat heals the player. Combat Superiority: This class feature now properly affects Terrifying Impact. Crushing Surge: The string of attacks from this power is now around 17% faster overall, resulting in increased damage output. Crushing Surge: The heal from the third hit of this power has been increased by 15%. Crushing Surge: The third hit of this power no longer incorrectly benefits less from the Power stat than intended. Ferocious Action: This passive power no longer incorrectly activates at 20% health at Rank 1. Ferocious Action: The Rank Up info of this power now correctly lists the percentage of health at which it activates. Kneebreaker: This power is now properly considered as melee damage. Knight’s Valor: Incoming damage from this power is no longer sometimes evaluated as an Encounter power for the purpose of triggering effects. Knight’s Valor: This power no longer incorrectly multiplies its Action Point gain for every target affected. Supremacy of Steel: The follow-up AoE power now properly benefits from stats and buffs on the player, and is properly affected by defenses on the target. Feat: Iron Guard: A typo in the tooltip has been addressed. Feat: Pin Down: This feat now properly adds .1 / .2 / .3 seconds to Prone time instead of adding 10 / 20 / 30%. Cloud of Steel: This power now has 8 maximum charges, down from 12. Cloud of Steel: Momentum is no longer maintained when jumping and throwing daggers. Duelist’s Flurry: This power no longer incorrectly gains slightly too much of a benefit from the Power stat. Duelist’s Flurry: When the bleed portion of this power is at 10 stacks, further applications now recalculate damage in addition to refreshing the duration. Gloaming Cut: This power works best as an execute, but lacked the damage to fill that role. To help it better serve its function, it now deals up to 50% more damage (at max rank) based on the target’s missing health. In addition, rank 3 of the power now provides more Stealth on kill, and rank 1 provides slightly less. Lurker’s Assault: This power now grants 15 / 20 / 25% bonus damage, down from 20 / 40 / 60%. Lurker’s Assault: This power now teleports the player to the targeted enemy, if an enemy is targeted. Lurker’s Assault: This power can no longer be canceled by Disable effects. Shadow Strike: This power no longer incorrectly gains slightly too much of a benefit from the Power stat. Sly Flourish: The benefit this power gains from the Power stat has been slightly reduced. Wicked Reminder: This power no longer incorrectly gains slightly too much of a benefit from the Power stat. Feat: Speed Swindle: This feat is now properly considered a Control effect for calculations and procs. All non-Augment companions now have a passive power that unlocks at Rank 30. Bounty items now go to the Currency bag when picked up. Bounty tokens that were in the Inventory will be auto-moved to the Currency bag. Bounty tokens now stack to 100, up from 40. The Currency bag now has 36 slots, up from 24. Items purchased via Seals and Glory are now bound to the character when purchased. When a player has a full inventory and walks over items that are automatically picked up, the items are now properly left on the ground. Improved 3D editing – We have added freecam for ease in making those larger structures as well as a full featured Drag and Drop interface for the Assert Library. We have also added support for editing encounters, NPC’s, clusters teleporters and more. To round it out we now support property editing in 3D as well. New Assets – We have added a host of new locations, assets, details and more to the Editors library. While most of the new assets are themed for Fury of the Feywild there are also plenty of author requested assets in there as well. We are looking forward to a Foundry Spotlight on quests telling tales on the Feywild! Improved Catalog Search – The Catalog now supports advanced searches. Advanced search is also supported on all of the catalog tabs. This will enable you to find just what you are looking for. You can use the simple search or get as detailed as you need to find the perfect quest for you. Inventory Updates – Managing your inventory has just gotten better in Gateway. With the next update you will be able to claim and Refine Astral Diamonds, open reward chests, view your professions assets and companions. Obtain Supplies from Gateway – On the professions overview tab you will find a supply store where you can purchase your professions supplies, bags, and booster packs. A Looking For Group channel has been added with /LFG and /LFM as aliases. “Interaction Failed” notifications no longer write to the chat box. They still appear on screen. It should no longer be required to press ESC twice to get out of chat text entry. Pressing Enter to start chatting now enters cursor mode, and sending a chat message (with no other windows open) now leaves cursor mode. The Trade channel now accepts /wtt, /wts, and /wtb as chat channel aliases. The Zone and LFG chat channels no longer allow item links. All other channels (e.g. guild chat, party chat, custom channels, and of course Trade) still allow item links. Trade and LFG are now default chat channels. Item links are now allowed in Trade. Inventory: Double-clicking to unequip a bag no longer sometimes causes that bag to disappear. Queue titles no longer have prefixes such as “Dungeon” or “Skirmish,” as there are now icons that display that information. Child’s Play is an amazing charity that “seeks to improve the lives of children in hospitals around the world through the kindness and generosity of the video game industry and the power of play”. In 2012, they raised over $5 million toward a cause that makes a real difference for kids batting against ailments in over 70 hospitals worldwide. Tomorrow, Neverwinter and PWI will be offering a 24-hour stream, during which players can donate and financially support Child’s Play. 24-Hour Neverwinter Child’s Play Marathon! Adventurers, your Neverwinter Community team is running a 24 hour Neverwinter marathon livestream on Tuesday, and we’ll be taking donations for Child’s Play! The livestream will be a true marathon: Our team will be going nonstop from noon on Tuesday until noon Wednesday, cracking jokes, running dungeons, hanging out with players, and fighting off sleep madness. If we make you laugh, think about donating to Child’s Play. We’ve set up a donation campaign with Child’s Play for this livestream, and you can donate here. Child’s Play works to make hospital stays easier for sick kids, by providing them with games, toys, books and more fun stuff. Your donations can make a scary situation a little bit easier for a sick child. In addition to showing off all the new Fury of the Feywild content on our Preview shard and hanging out with players, we’re going to be giving away prizes, having drop-ins with one or two devs, and guest-starring other members of the Perfect World team. Make sure to tune in on Tuesday for this massive marathon for charity! The livestream will be up at http://www.twitch.tv/perfectworld_community. You can donate to Child’s Play here. Hmmm. Big new announcements every week and special events every other week or so? Feels like Neverwinter’s stretching a bit thin and trying too hard. New event plus big Zen discounts on items? You’ve got a solid title on your hands. Adjust the Zen prices where they really *should* be and you won’t have to firesale items twice a month. We’re excited to announce the new event, Call to Arms: Orc Assault, is now live. This event involves a Skirmish event in the Tower District that you may be familiar with – but there’s a twist! The rewards are now more plentiful and this special Skirmish event is available for players level 5-60. How will it work? Players will be able to queue up for this event using the in-game Queue system any time they wish! Once players are inside the skirmish, they must successfully fend off waves of incoming orcs to protect the Tower District. If they are successful, they will be rewarded with a chest which may contain some valuable items including a unique “Orc-style” weapon which they can use to transmute, or change the appearance of, their weapons. Also, fortunate players may be rewarded with a new variant of Wolf companions to fight alongside them along with Savage Enchantments and more! And, to celebrate this new event, we’re introducing a new sale with 30% off many popular items in Neverwinter’s Zen Market. What’s on sale during this limited-time period? Are you ready to take down the orcs of Tower District for some awesome rewards? Discuss it on the officialNeverwinter forums. Wow. Two million players? I feel that number’s a bit skewed since they’re claiming the just launched “over a month ago”, but folks have been playing the game in a rather open beta for months. That said, the capitol on my server has 6k-7k players on every single time I log in. Impressive to be sure. I wonder how many active players still exist and what that number will look like in another 30 days as far more folks reach endgame and see what (little) there is to do at level cap. 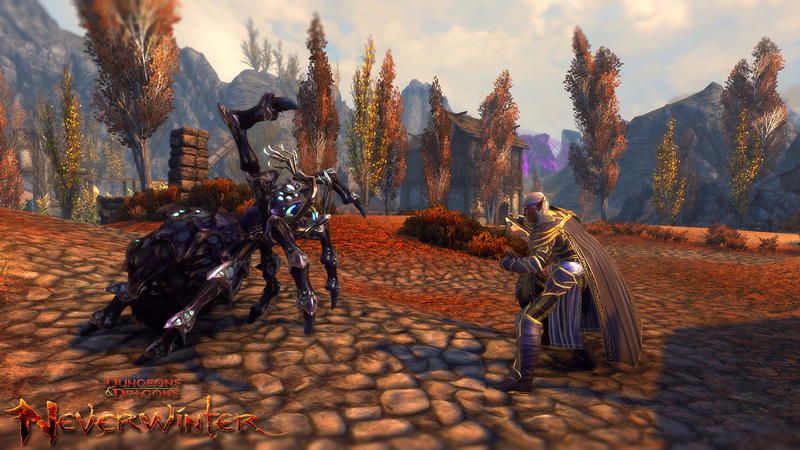 Neverwinter launched just over a month ago and we’ve already received many positive reviews from critics and fans alike. We’re also very honored to achieve numerous accolades from a variety of gaming sites. We’ve also reached another incredible milestone: 2 million players – that’s right! 2 million unique players are fighting in the Forgotten Realms against Valindra Shadowmantle and other iconic Dungeons & Dragons creatures. What other milestones have we achieved? Check out this infographic! And, this is just the beginning for Neverwinter. We’ve got the Fury of the Feywild Module which will be live on August 22, 2013. Can’t wait until then? You can explore Sharandar on our Preview test shard right now!Are you excited about our milestone and the upcoming Module? Discuss it on the official Neverwinterforums. This weekend only, Neverwinter is offering chances to win Gift of Tymora boxes as additional loot from killing mobs. One of six different reward types is possible from each box including Astral Diamonds and rare armor and weapons! It’s a bit weird that the Neverwinter folks JUST posted this earlier today given the event STARTS today, but…it is free stuff. Good luck! 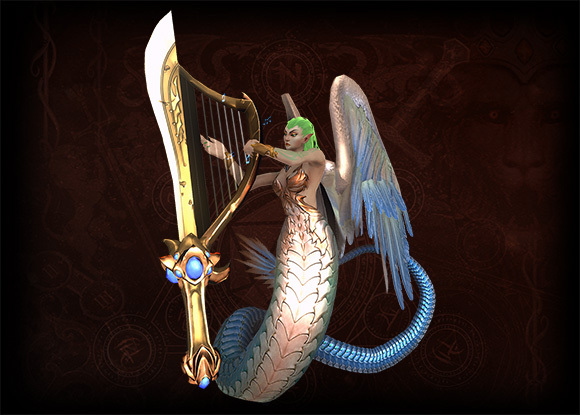 Tymora, the Goddess of Good Fortune, has seen the bold bravery of adventurers in Neverwinter and has decided to reward the risks they took with a chance at good fortune! Starting this Friday, 7/26, adventurers may be rewarded with Gift of Tymora boxes in addition to any loot they pick up! We’re excited to bring you this fun, exciting, and rewarding event for all the Neverwinter fans out there! Please note that these boxes will not drop inside Gauntlgrym because Tymora felt it a bit much to clutter the battlefield with her sparkling gifts. Are you ready to slay creatures of the Forgotten Realms for a chance at some rare drops? Let us know on the official Neverwinter forums. From now until August 1, you can purchase a Professions Asset Pack or a Professions Booster Pack from the Zen Market and have a chance to receive Lillend, the first purple quality companion healer! During this promotional period, if you don’t receive a Lillend Companion in your Professions Pack, you will find Tarmalune Trade Bars instead! Lillend has initial points in Power, Critical Strike, and Armor Penetration, as well as three Offense Slotsfor Runestones and three ring slots. As a purple quality companion, Lillend has a Max Rank of 30, providing you with four different skins from which to pick. 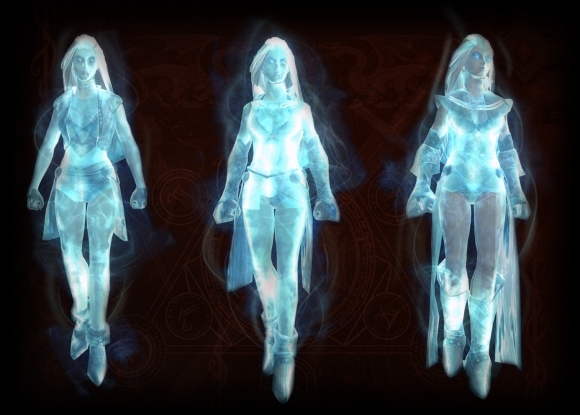 The Ghost is an ethereal companion who is ready to fight at your side to overthrow the evil that encroaches upon Neverwinter! The troubled soul of Theratra, an unfortunate former halfling, believes you can help her find the adventure she lacked when living. Her ghostly form makes Theratra the perfect control companion, giving you the advantage in a fight even when you appear outnumbered! The Ghost Companion has initial points in Power, Critical Strike, and Armor Penetration, as well as oneOffense Slot and two Defense Slots for Runestones, two ring slots, and one neck slot. As a rare quality companion, the Ghost has a Max Rank of 25, providing you with three different skins from which to pick. 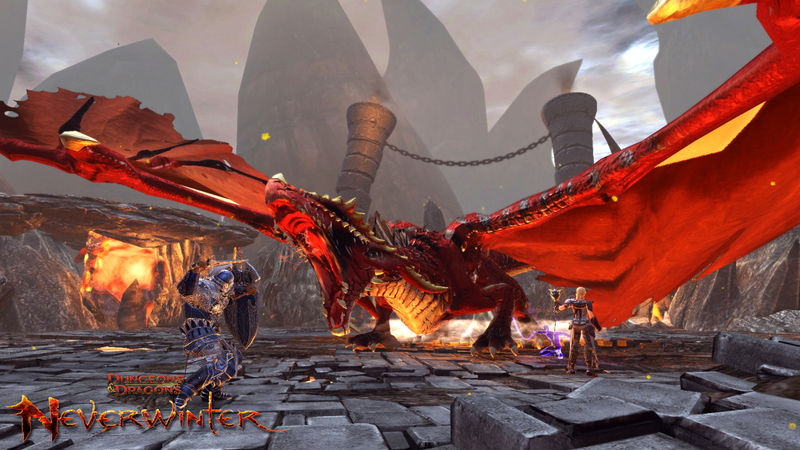 The first content expansion for Neverwinter is just a month away. I think all of the players who spend $200 on the Hero of the North Packs are gonna be peeved to say the least that they now need to spend $60 to reap the benefits of the new expansion. Who knew the first expansion would come so soon after launch? One of the biggest issues players have had with the game has been the exorbitant costs for purchasing Zen items. Having to pay $60 every few months just to have access to all content is rather steep. We’re proud to announce that Fury of the Feywild, Neverwinter’s first content expansion, will be live on August 22, 2013 – just a month away! We’re extremely excited to bring you into the new adventure zone of Sharandar and introduce new game features like the Campaign System, new Professions, new loot, and much more! Click here to learn more about Fury of the Feywild’s development direct from Cryptic Studios developers. To get players ready for the dangerous journey ahead, we’re introducing two new packs filled with unique items including companions, fashion, and more! Knight of the Feywild Pack – Here are just some of the items and unique items. Click here to learn more and purchase. Feywild Starter Pack – Here are the items you’ll receive. Click here to learn more and purchase. Please note that you are able to purchase multiple Feywild Starter Packs for your account! 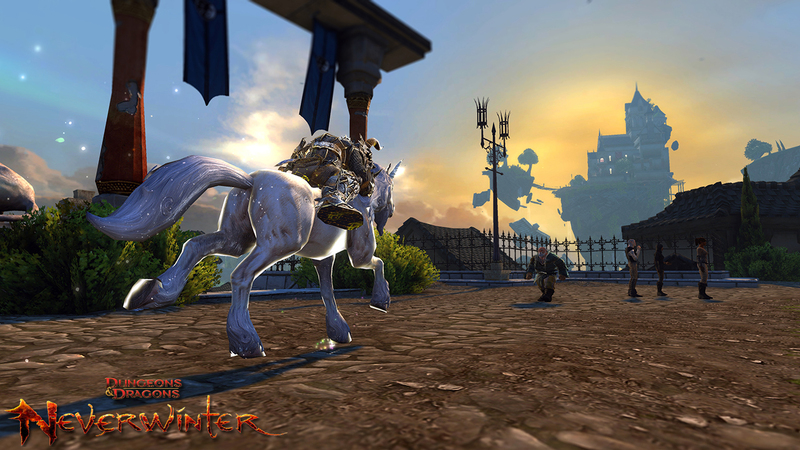 Are you excited to show off your new Dawn Unicorn Mount or Sylph Companion in Sharandar? Let us know on the official Neverwinter forums.